Pipeforce was formed ten years ago, in the recession, by Hugh and Claire Devlin. With many years of experience in pipe and fittings gained as distributor for a leading pipe manufacturer, Hugh decided that the time had come to offer the trade pipe market a new model. Claire joined him with her sales and marketing experience and a great team was born. 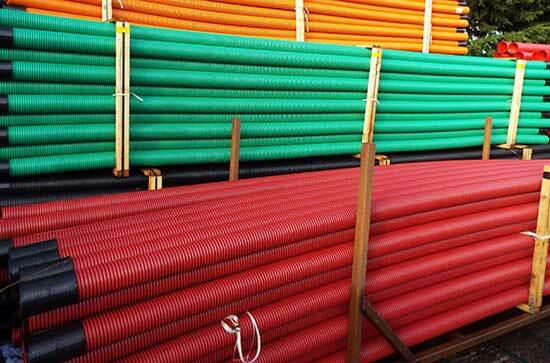 Unlike other trade suppliers, Pipeforce carry a large stock at all times, lead times are short, usually just a matter of scheduling delivery. The premises in Rathcoole is an ideal base, close to the M50, M4, M7 and the city. In 2018 Claire noticed an increased amount of enquiries regarding Electrofusion training, as pipeforce supply both HDPE pipe and E/F fittings the natural progression was to offer EFwelding training. Pipeforce in conjunction with technical innovation services now offer certified one day ef welding courses every 6 weeks. Always seeking new suppliers, Hugh sources pipe and fittings throughout Europe, offering Pipeforce customers quality and value. Brexit holds nothing but new opportunity for Pipeforce. A progressive Irish family business moving forward together.